Many people may know Lizzy Weekes through her activism. She was instrumental in the organization of last winter’s trip to Washington D.C. for the Women’s March. As a senior Studio Art major and Biology and Psychology minor, Weekes uses her art to combine different parts of her identity and explore issues surrounding mental health. From a young age, Weekes was encouraged by her mother to explore her creative side. In her creative endeavors was where she found herself excelling. With fears over the practicality of an art major looming, Weekes was planning on studying something along the lines of molecular engineering when she first arrived at Lawrence. Though, after taking Introduction to Studio Art her freshman year, she began exploring her art again. Weekes, like many Lawrentians, changed her major several times, both officially and unofficially. While she has shifted her focus to art, she did not loose sight of her love for biology. Some of her favorite classes at Lawrence have been Psychopharmacology and Entomology. One of her favorite art classes was her junior experience, after which Weekes was asked to be a studio assistant over the summer. As a Studio Art major, Weekes’s Senior Experience will be a showcase in the senior gallery at the end of Spring Term. She has chosen to make an installation piece exploring themes of mental health. The piece will be about interpersonal interactions and about life at Lawrence. The specific issues she wants to explore are anxiety, depression and grief. Weekes plans to interview different people in the ceramics studio and have them make something out of clay while talking. Weekes refers to this as a sort of “unlicensed art therapy.” Clay is also one of the main mediums used for art therapy because it is so tactile, and it is possible to focus on something else, like talking, while still working with the clay. As another dimension to her piece, Weekes plans to incorporate embroidery. She is going to make a tent and use it as a confined space people can walk into and be immersed in. Her plan is to “graffiti” the walls with embroidery. She also plans to incorporate the pieces that people make during her interviews. Allowing other people to contribute to her project is also an experiment in giving up some control and making the art a shared experience. This is also why Weekes choose to do an installation piece—in order to make the piece interactive, so people can experience and not just observe or study. This is a way to reach out to other people with similar experiences and make human connections, as well as a way to share her own coping mechanism. Weekes’s love for fiber arts goes back a long time, to childhood hand sewing. She only began exploring embroidery in the past few years. She is fascinated with the idea of reclaiming an art that was once considered to be just a hand hobby designated for women, though handy crafts and fine arts are not mutually exclusive. The history of textiles as it intermixes with femininity and feminism is something Weekes has enjoyed discovering and will continue to delve into. After graduation, Weekes would love to go to graduate school and study art therapy. This would combine her love of art and psychology with her advocacy for mental health. 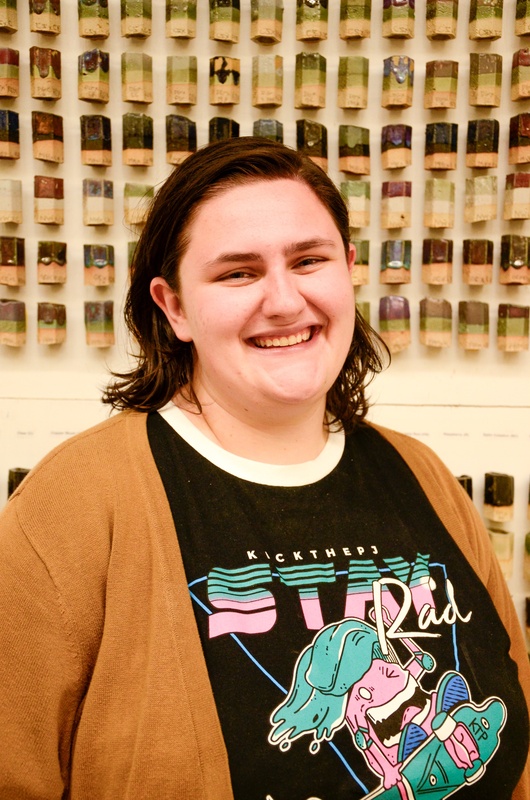 You can look for Weekes’s project at the Studio Art Major Senior Exhibitions collection at the Wriston Art Centre Galleries at the end of the year.